ROYAL OAK, MI, Feb. 19th, 2011 -- Digital Jukebox Technologies, LLC. has recently entered into agreements with all three U.S. based Performing Rights Organizations: ASCAP, BMI and SESAC, authorizing the use of JukeANator digital jukebox software for public performances of music consistent with the terms of their licensing requirements. This is very significant because, since 2007, jukebox operators/bar owners with JukeANator digital jukeboxes have not been able to use a Jukebox License Office (JLO) agreement in order to have the permission to play music in public settings. Unauthorized public performances of music by either attempting to use a JLO license, having ASCAP/BMI/SESAC licensing without acknowledgement of their digital jukebox or having no paid public performance licensing at all. 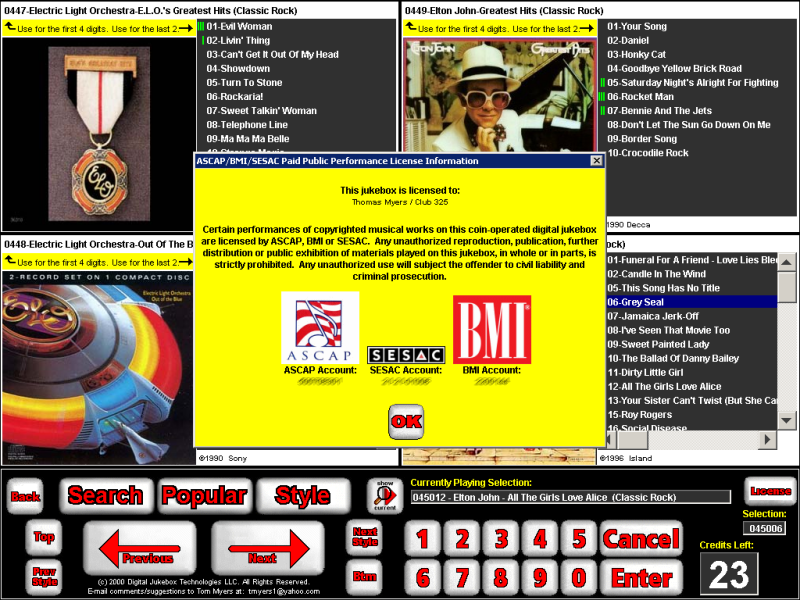 It is strongly urged for all U.S./Puerto Rico customers of JukeANator commercial to either upgrade to the new "ASCAP/BMI/SESAC Mode" of JukeANator or discontinue use of JukeANator, lest they be subject to heavy penalties for violation of copyright law. 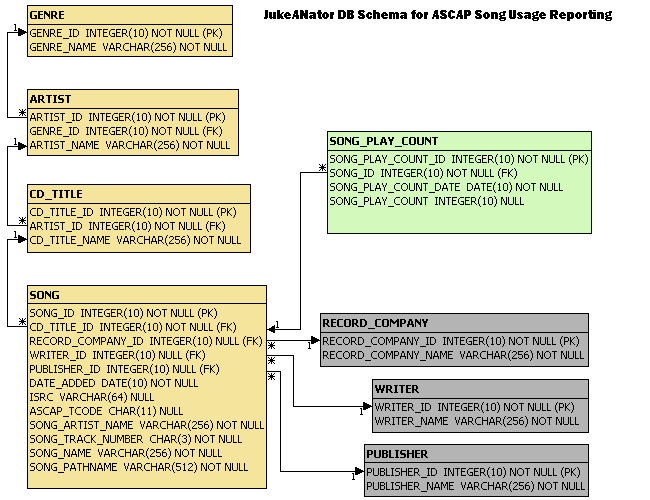 JukeANator ASCAP/BMI/SESAC Mode Yearly Subscription Pricing ONLY: This option is for customers who already have separate ASCAP/BMI/SESAC accounts (in this case, you need to apply for your own digital jukebox licensing and add the jukebox to your account) For this scenario, you need to submit the four quarterly song usage reports to Digital Jukebox Technologies, LLC and pay a minimal processing fee for handling these reports and generating new year license keys. JukeANator is next generation digital jukebox software that allows you to easily navigate and play any song in your music library. It has the look and feel of a bar-style CD jukebox and can be used, for example, in a custom cabinet with a touch-screen in your game room, or on your desktop as the most easy-to-use MP3 Jukebox application, right along side your other applications. With the commercial version and a bill acceptor, operators/owners have an attractive and flexible alternative to the expensive high-profile commercial digital jukeboxes on the market. It can be used for custom built Digital Jukeboxes, retrofit/upgrade of existing audio CD jukeboxes or conversion of existing digital jukeboxes.